For many years, our family has celebrated Christmas Eve with the traditional Southern Italian Feast of the Seven Fishes (Festa Dei Sette Pesci), also known as The Vigil (La Vigilia). The origins of this celebration are Roman Catholic — on Christmas Eve in particular, it is a commemoration of the wait for the midnight birth of the baby Jesus (Vigilia di Natale), and stems from the Catholic tradition of abstinence, in this case, refraining from the consumption of meat or milk products, on Fridays and specific holy days — but, as with many Americanized traditions, it is now celebrated by people of all backgrounds and faiths. The origin of the number 7 is open to interpretation — some say it represents the number of sacraments, or the number of virtues, or simply that the number represents perfection. The menu itself is neither rigid nor does it require exactly seven fishes or courses (some menus feature as many as 13 different fishes), and thus would typically feature any fresh fish that is available locally. Though specific dishes are not required, a traditional vigil must include Baccalà – salted cod that was also considered peasant food (and could be enjoyed even in the most impoverished parts of Italy) and fried smelts (a small fish that is eaten whole). Other common fishes include calamari, mussels and clams (often with pasta). December 24. Crab arancini! Burrata! Pollo di Natale! Alfredo’s website now has an a la carte menu for their Christmas Eve Vigil. Decemeber 24. Totaro offers dine-in or take-out (please provide 24 hours notice), and features fried smelts, a baccalà salad and lots and lots of calamari. $47 per person, take-out is a la carte. Manayunk’s Gemelli and Center City’s Amis also have events. Did we miss any? Let us know and we’ll add them to the list! 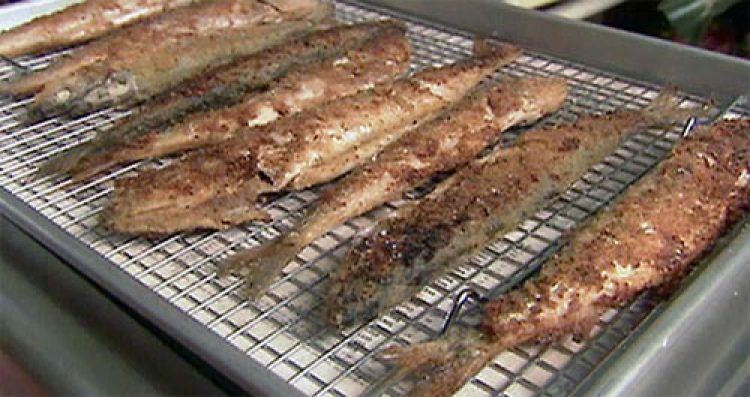 Note: the picture above is from Alton Brown’s Pan-Fried Smelts recipe. Frankie’s Fellini Cafe and Bakery in Drexel Hill, the latest offering from CIA graduate chef Frank Chiavaroli is also doing the 7 fishes for Christmas Eve.